The warm weather inspires clean eating and active living, or at least makes these things a little more accessible. With bushels of fresh and juicy fruit at our disposal, eating healthy isn’t so much of a punishment as a treat. And sunny skies and dry ground make going for walks, runs or hikes as easy as stepping out your front door, no hassle required. Winter, on the other hand, triggers in many of us a desire to go into hibernation. Daylight is fleeting, meaning we have less energy. It’s cold outside, which makes hot comfort foods all the more enticing. Plus inclement weather conditions mean doing anything outdoors requires bundling up and braving the cold, making getting outside a chore. Not to mention the fact that ice and dropping temperatures can make outdoor activities dangerous. As a result, you might find winter is the time you end up piling on the pounds and forming unhealthy habits you’ll regret once the warm weather arrives again. It’s especially easy to fall into these poor habits after the holidays, once you’ve overindulged in treats and spent far too many days in a row lazing around. I speak from a lot of experience on this, as most years my New Year’s resolution is to lose at least 14 pounds! I try to keep fit with karate, yoga and zumba, but classes often close around the holidays, making it difficult to stay motivated. A few years ago, I decided to have a complete break from my routines for three weeks. I got into the festive spirit a little too much and gained my inevitable pounds, but worse than this, I felt really out of shape, bloated and my legs seemed to seize up, aching after going up and down the stairs occasionally. Feeling like that taught me to still try and stay fit, especially as the weather gets colder. 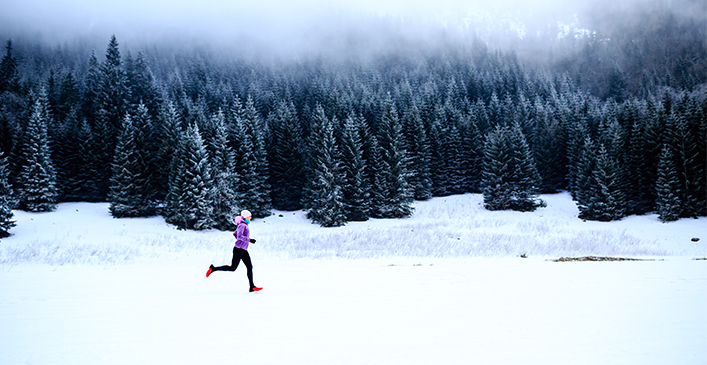 If you’re looking for simpler ways of staying active this winter, look no further. Personally, because my classes shut down for a few weeks, I make time to follow exercise DVDs in my home. If you are lacking funds, time, or motivation this can be a great way to continue to exercise in the winter months. There are a wide range of DVDs out there and plenty of fitness videos available for free or a small cost online as well. This is particularly useful if you get bored easily as you’ll have a vast variety of routines and disciplines to choose from. One disadvantage I find to not attending a class is the lack of company, however the upside to this is that you don’t feel quite so self-conscious. Simply roll out of bed, put on a pair of sweatpants, and follow the fitness video to the best of your ability, with no worry of judgment! If you do find that you need others in order to stay motivated, why not host fitness sessions in your own home? Invite a couple of friends to work out with you one or two times a week and do the exercise routines together. You could even use this as an opportunity to experiment with new disciplines, learning the basics of yoga or kickboxing together. Cold weather is no excuse to spend your downtime sitting on the couch watching TV. If working out isn’t your thing, you need to find other ways to organically stay moving. Activities that involve your family are great because they double as bonding time and exercise. For example, if you have a game console such as the Wii, playing games such as Wii Fit is a fun way to spend time with your family while burning some extra calories. These activities don’t necessarily have to be sport related. Games such as Twister or even charades are a fun way to keep you moving around and laughing. Maybe you even enjoy informally dancing with your friends or family. Put on some music and get moving, even (or especially) if it’s just you in the house! If you are lucky enough to be in a situation where you have some spare time over the winter period, you could use this to your advantage by doing those more physical jobs you have been putting off all year. Tasks associated with redecorating are sure to work up a sweat. Some jobs such as painting, ripping down wallpaper, and installing flooring are more labor intensive. Others, such as hanging pictures, rearranging furniture, and reorganizing, are less so but still get you up on your feet. It’s surprising how tasks such as these can naturally tone your muscles, so do it yourself instead of hiring someone on! One of the simplest things you can do is make small modifications to tasks you already need to do. Need to get a few things from downstairs? Take a trip for each item, even if it’s not necessary. Have a bunch of paperwork to do? Do so at the kitchen counter so you can remain standing up. Need to cook dinner? See how many squats it will take before the water starts to boil for spaghetti. See how many push ups you can do before the timer goes off on the microwave. It’s all about fitting in more movement where you can! Actually Embrace the Cold Weather! Snow can be both a blessing and a curse. While looking pretty and festive on one hand, it can make it very inconvenient if you have to drive any distance and the thought of it can make you just want to crawl under the bed covers! Instead of adopting this attitude though, why not embrace the situation? There is plenty of fun to be had outside if you wrap up warm. It’s amazing how much more enjoyable the outdoors are if you invest in the right clothing. A warm coat and sturdy, waterproof boots make all the difference in the world in the wintertime. You could go for a walk, take the kids sledding, build snowmen, create snow angels, even check out a local ice rink. All of these activities will subtly burn calories and keep you in shape over the winter.